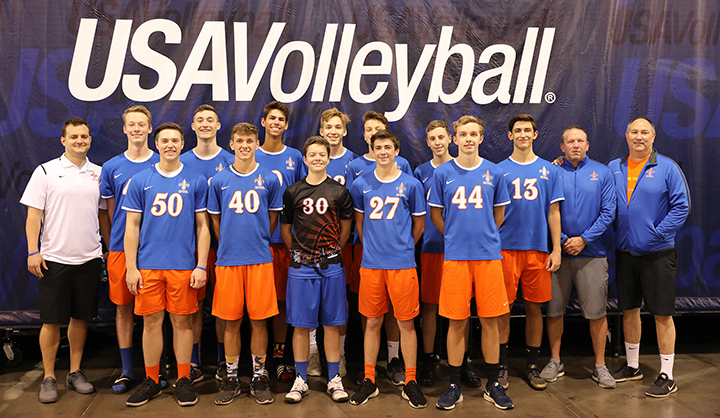 SPVB 18 Alpha went 9-2 and won the 18 USA division of the 2018 USAV Boys Junior National Volleyball Championships in Phoenix, Arizona. It was the Aurora-based club’s first boys title at BJNCs. Team members are Edward Jakubauskas, Parker Nelson, Jakub Migus, Cameron Menini, Matthew Russo, John Kenny, Petar Lumovic, Jeremy Cardenas, Ryan Swartz, Matthew Nealon, John Davis and Andrew Kohut. John Davis from Naperville Central and Matt Nealon and Andrew Kohut from Metea Valley were named to the 18 USA division all-tournament team. Nealon, a 6-1 setter, was named tournament MVP. 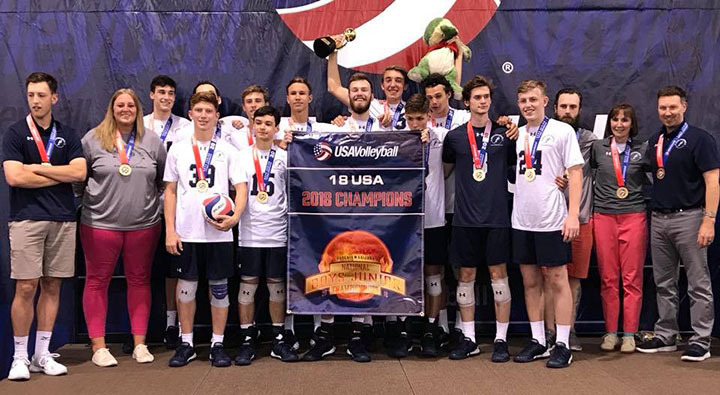 Also, Neuqua Valley’s Kevin Kauling of SPVB 18 Elite, which finished fifth in the 18 Open division, was named to the 18 Open all-tournament team. In the 16 USA division, Adversity Adidas 16 Purple (pictured above), based out of Vernon Hills, went 8-3 and finished second, falling to SASBoys 16s (Serve & Spike Volleyball Club out of Honolulu, Hawaii) 25-18, 26-24 in the championship match. Adversity Adidas 16 Purple team members are: Lukas Pytlak, Kyle Orton, Andrew Wagan, Aidan Rico, Jesse Knuckles, Sonomdorj Tsogtbaatar, Logan Schaedel, Ben Ridgway, Evan Bajerski, David Foecking and Justin Ross. The head coach is Alan Ceisel. Ben Ridgway of Barrington, and Evan Bajerski and Lukas Pytlak of Lake Zurich were named to the 16 USA division all-tournament team. In the 16 Open division, St. Louis-based HPSTL B16 Royal (pictured above), which features four players from the Illinois side of the Mississippi River, finished 11th, the highest finish by a team from the Midwest in the field. The Illinois players are Connor Sheehan (40) and Easton Gavin (27) from O’Fallon and Max Sellers (30) and Josh Whittenburg (50) from Edwardsville. In the 17 Open division, Ultimate B17 Gold (pictured above) went 8-3 and finished second, falling 15-25, 25-22, 15-13 to Bay to Bay 16-1 out of the San Jose, California, area in the championship match. Team members are Zachary Bulthuis, Chris Dargan, Andrew Wilkinson, Ben Pluskota, Wil McPhillps, Danny Pacini, Marty Jepsen, Louden Moran, Jack Yurkanin, Nicky Studer and David Flores. Marty Jepsen from Marist, Wil McPhillips of Lincoln-Way East and David Flores of Lincoln-Way West were named to the all-tournament team. 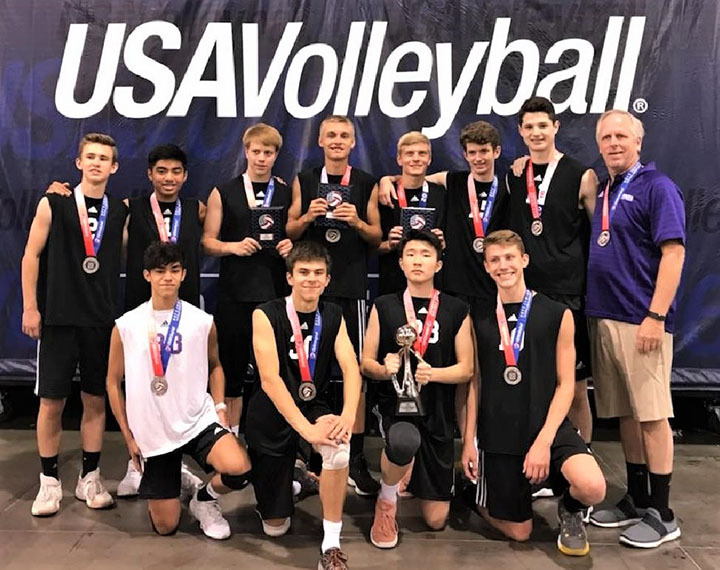 Other all-tournament selections from Illinois were Aidan Peterson of Hitmen 16 Black in the 16 USA division, and Henry Clemons (Loyola) of Chicago Bounce 17 Red and Theodor Butler (Plainfield North) of Club 1 17 Red in the 17 Club division. 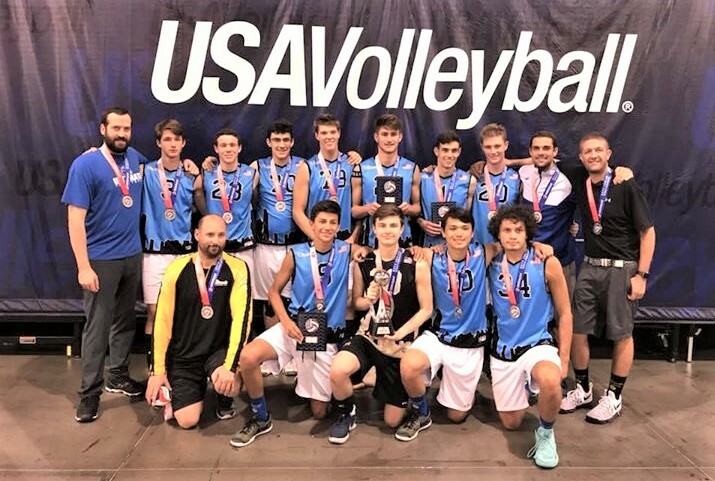 2018 USAV Boys’ Junior National Championships Monday, July 2-Monday, July 9, 2018, in Phoenix Convention Center, Phoenix, Arizona. Adversity Adidas 16 purple took 2nd, won silver in the 16 USA division.